Candide had scarcely reached his inn when he was attacked by a slight illness caused by fatigue. As he wore an enormous diamond on his finger, and a prodigiously heavy strong-box had been observed in his train, he immediately had with him two doctors he had not asked for, several intimate friends who would not leave him and two devotees who kept making him broth. So read a snippet from Voltaire's Candide , and the same tone pervaded the whole book. The writer's sharp prose was aimed particularly at one man: Gottfried Wilhelm Leibniz, who proclaimed the Earth, despite its many shortcomings, "the best of all possible worlds." Voltaire begged to differ. Besides the target of Voltaire's ridicule, Leibniz is perhaps best remembered as Newton's rival in the development of calculus. Modern historians conclude that Leibniz made his advances independently, though Newton noisily accused him of plagiarism, and Leibniz developed the useful notation and symbols that calculus students still learn today. But Leibniz was really a polymath. His invention of a calculating machine earned him membership in the Royal Society of London. The scope of his talents prompted Diderot to remark that comparing oneself to Leibniz left one wanting to "go die peacefully in the depths of some dark corner." Yet Leibniz also discussed prophets, genies and monsters. Historian Roger Ariew argues that modern scholars have viewed Leibniz as two people: "the logician-metaphysician" deserving serious attention and the "shallow, theologian-natural philosopher" deserving no attention at all. Like his rival Newton (who practiced alchemy and numerology), Leibniz was simply a man of his time. In 1677, on behalf of his employer, Leibniz sent the Journal des Savans an account of a monstrous goat. He speculated that the goat's unusually fancy hairdo might owe its existence to the goat's unhappiness over its confinement, and further relayed that when the goat kicked at a passerby, its headdress grew. He also wrote of a "talking dog" capable of barking about 30 words, although he clarified that the dog only echoed words said to it. In fact, his accounts of bizarre animals were fairly sober and restrained for the 17th century. In between monsters and math, Leibniz also took an interest in the history of our planet. As an intended preface to his history of the House of Brunswick, Leibniz wrote an overview of the history of the Earth, Protogaea . Among other topics, the book included how the planet formed, subterranean fires, and the formation of fossils. Leibniz penned the manuscript between 1691 and 1693, but the book wasn't published until 1749, well after his death. Rather than being a comprehensive account of Earth science, Protogaea was more of a jumbled collection of observations and speculations, but it contained a few insights that arguably placed Leibniz well ahead of his time. During the 17th century, savants still struggled with the definition of a fossil, and this was complicated by the fact that a fossil could be defined as anything dug out of the ground. Leibniz recognized the different origins of different types of "fossils" and knew that some of them (crystals) might very well have formed where they were found. When it came to the objects we define as fossils today — any evidence of ancient life — Leibniz's views changed over time. Early on, he had been influenced by the Jesuit polymath Athanasius Kircher, who suggested that fossils sometimes (not always) resulted from "jokes of nature." In fact, Kircher's writings had a profound influence on the young Leibniz, who sent the priest fawning correspondence. As the years progressed, however, Leibniz began to ridicule his former idol. Modern historians have noted, though, that just about every topic Leibniz researched may have been inspired by Kircher's work. Later on, Leibniz developed a tremendous admiration for the natural historian Niels Stensen, or Nicolaus Steno (whose eventual decision to enter the clergy greatly disappointed Leibniz). Like Steno, Leibniz adopted the view that fossils were the remains of once-living organisms. He reproduced a picture of the shark head that Steno dissected, along with examples of shark teeth. One also finds there a great number of teeth of various color, often white, and frequently implanted on pieces of jawbones; some of them are of such magnitude that they cannot be referred to any actually known animal. Leibniz's writings hint at the concept of extinction, but he also believed that petrifaction transformed them in some way. Leibniz believed in (as did most of his contemporaries) the short time span for Earth's existence, as implied by a literal reading of Genesis. He also believed in the Noachian flood, but he thought it was one of several, and that when the waters receded, they returned to subterranean caverns through narrow passageways — depositing fossils in their wake. In his view, this explained some of the fossils of seashells embedded in the rocks of high peaks. In accordance with Biblical teachings, Leibniz also believed the Earth had been shaped by fire, but some of his speculations on subterranean fire had a modern ring. For most believe that there is fire contained in this globe, whose crust we have hardly explored. Earthquakes also may clearly indicate that there are tunnels of fire, and huge volcanoes reveal fire dungeons extending far and wide. The real goal of study is human happiness, in other words a lasting pleasure, attainable to so many individuals that they would not live in idleness . . . to use their talents to practice unpretentious virtue, to attain a blameless knowledge of God and to promote the common good. When Leibniz and Peter finally met a few years later, the czar recruited the polymath as privy councilor, even though Peter's plans for a Kunstkamera (curiosity cabinet) were already somewhat underway. When the Kunstkamera finally did open, it wasn't the world's first public museum (the Ashmolean Museum, for one, had gotten there first), but Peter went one better in offering free admission. By some accounts, the Russian institution even fed its guests treats, paid for out of Peter's pocket. Leibniz combined a modern understanding of fossils (evidence of past life) with mythology. 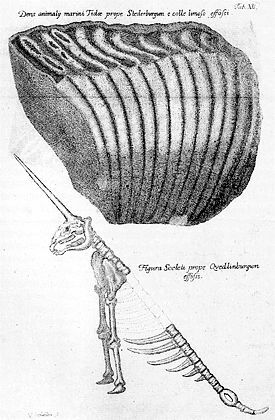 Along with engravings of fossil ammonites, shark teeth, and bony fish, he included in Protogaea an engraving of a fossil unicorn, based on a find announced by Otto von Guericke. The unicorn appeared next to an engraving of a mammoth molar. Leibniz pointed out to his readers von Guericke's impressive credentials, including his invention of the vacuum pump, as a reason to believe the account. Likely based on renderings in contemporary periodicals, the unicorn lacked hind legs. Misguided as it was, this fossil articulation ranked among the earliest attempts to reconstruct a fossil vertebrate. Leibniz actually began the unicorn description with a statement that some unicorns "come from fish from the Northern Ocean" — an acknowledgment that fabled unicorn horns were often narwhal tusks. But he then launched into a description of von Guericke's fossil find from a gypsum quarry near Quedlinburg. The unicorn fossil was likely cobbled together from the remains of a mammoth and maybe a rhinoceros. Leibniz himself probably wouldn't be surprised at the news that some of his views were in error. Displaying the kind of optimism Voltaire ridiculed, Leibniz professed faith in the future. This theory about the newborn globe may be plausible, and it may even contain the seeds of a new science called natural geography, but we venture to explore rather than to build. . . . And even if the vestiges of the old world conform to the present appearance of things, our descendants will be able to explain everything better when human curiosity will have advanced far enough to describe the kinds and layers of Earth that extend through the various territories.